What is Happy to Translate? 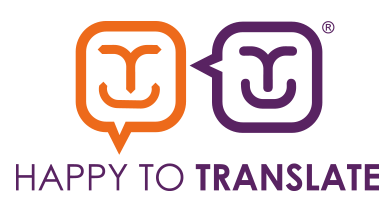 Happy to Translate (HTT) is a national scheme for language and communication assistance. The logo is displayed by HTT member organisations to inform people with little or no English that language assistance is available. Members are encouraged to display the logo prominently on documentation, websites and emails and also in public areas such as receptions and interview rooms. What are the objectives of HTT? HTT was established to achieve the following main objectives. work collaboratively to develop a cohesive approach to national provision of high quality language services. Which types of organisations can join HTT? HTT is relevant to all types of organisation - public, private, charitable or voluntary, that wish to provide equal access to information, goods and services. HTT was founded to promote a joined-up, good practice approach linking all members or prospective members that aspire to a common set of standards to overcome language barriers. A list of HTT members can be found here. What are the key benefits for members? Membership of HTT helps organisations become accessible to all communities, widening the appeal and reach of their goods and services. HTT aims align with organisations’ strategy and Equality & Diversity Policy, underpinning legislative and regulatory compliance work. Invitations to HTT meetings and events where members share ideas and good practice for providing services to people who encounter language barriers. HTT Feedback Forms enable organisations to monitor the use of and demand for language provision and to identify gaps in service delivery. Members can contact the HTT team for guidance and support. The logo has been proactively marketed amongst ethnic minority communities, raising awareness of what HTT means for them. Individuals know that they can approach HTT organisations with the confidence that their language needs will be met, enabling them to access information and services. Working with HTT tools and processes gives staff the confidence to engage successfully with members of the public who face a language barrier. HTT training defines good practice and goes through step-by-step guidance on how to use HTT tools and processes to overcome language barriers. We already have a language service provider so why do we need HTT? HTT tools and processes plug the critical gap between initial contact with a customer who has little or no English and being able to identify their language and engage with them to establish their requirements via a telephone interpreter. HTT is a unique solution for dealing with the first encounter in a professional way that does not leave people feeling stressed, frustrated or annoyed at being unable to communicate their needs. The HTT logo is easily recognisable and showcases your organisation’s commitment to excellent customer service for all, regardless of language or nationality. The logo encourages customers to approach the organisation, confident that their language needs will be met. HTT enables efficient identification of customers’ language and requirements, ensuring effective use of language services. HTT dovetails with an organisation’s existing systems and can be incorporated into the induction of new staff. As a result, HTT expertise becomes embedded in the organisation. What will be required of our organisation? Members are asked to display the HTT logo prominently on their premises and across their print and digital media. HTT members pay an annual subscription and new members are expected to commence HTT training as soon as is practical after joining to gain maximum benefit from membership. There are several training options including sessions run by our dedicated trainers at your premises or you may wish to join one of our open training sessions. Members are required to uphold the 7 Key Commitments (Link to Key Commitments) which help them to implement HTT within existing strategy, policies and processes. All members are expected to open or maintain an account with a telephone interpretation service. We can provide a list of service providers, some of whom offer discounted HTT member-only rates. Where and how can we use the Logo? Displaying the HTT logo widely demonstrates your organisation’s commitment to equality. Once approved for membership, your organisation should use the logo where it is clearly visible to the public – for example, in reception areas and meeting rooms, on printed information, materials, publications, on your website and email footers. Does our entire organisation have to apply for membership? Yes, this helps to ensure that HTT processes and procedures are implemented consistently throughout the whole organisation and to ensure that service standards are uniformly high. The annual subscription is based on the number of full-time equivalent (FTE) staff employed by your organisation. We would be happy to provide a quote for your organisation. There will also be costs associated with training and any additional printed materials your organisation requires. Please contact info@happytotranslate.com for further details. How will our use of HTT be audited and how often? Members are responsible for undertaking periodic self-evaluation. HTT provides a template for this and is happy to provide ongoing support and advice. The first self-evaluation usually occurs after an organisation has been a member for around a year. Subsequent evaluations are recommended on an annual basis. You can print off and complete the Membership Application Form and forward it to us or submit it online. It must be signed by an authorised person in your organisation. We will be in touch as soon as possible to complete the joining process. Can I access the HTT Mobile App? All members have secure access to the HTT Mobile App which has been specially designed to make it easy to use HTT tools wherever and whenever they are required. The app is simple to download and intuitive to use and has proven invaluable for staff working in the field. Please contact the HTT team to discuss membership. Does HTT provide interpretation and translation? HTT is not a language service provider. However HTT members can take advantage of reduced rates with certain language service providers. A list of these is available on our Members’ website. Should you have any queries please contact a member of the HTT Team.